$145.80 The Jay Companies 1470324 Round Edge Gold Glass Charger Plate 13"
$135.66 The Jay Companies 1470326 Round Halley Gold Charger Plate 13"
$51.41 The Jay Companies 1182760 Round Gold Pebbled Charger Plate 13"
$89.96 The Jay Companies 1320377 Round Gold Aristocrat Charger Plate 14"
$81.00 The Jay Companies 1270275-4 Round Gold Beaded Charger Plate 13"
$89.96 The Jay Companies 1320391 Round Embossed Gold Charger Plate 14"
$51.41 The Jay Companies 1182763 Round Gold Hammered Charger Plate 13"
$59.98 The Jay Companies 1470058 Round Glass Braid Gold Glitter Charger Plate 13"
$81.00 The Jay Companies A466GRK-W Round Gold Leaf Rim Charger Plate 13"
$127.09 The Jay Companies 1470349 Round Sunray Gold Glass Charger Plate 13"
$137.70 The Jay Companies 1900054 Round Pearl Gold Glass Charger Plate 13"
$64.80 The Jay Companies A215GR Round Gold Regency Charger Plate 13"
$71.40 The Jay Companies 1270278-4 Round Gold Links Charger Plate 13"
$74.26 The Jay Companies 1427590BK Round Gold Mosaic Charger Plate 13"
$74.26 The Jay Companies A467GR Round Gold Jeweled Rim Charger Plate 13"
The Jay Companies 1332564 American Atelier Round Gold Placemat is an ultra-chic piece that can be used at the finest occasions to dress up your table with a festive look. 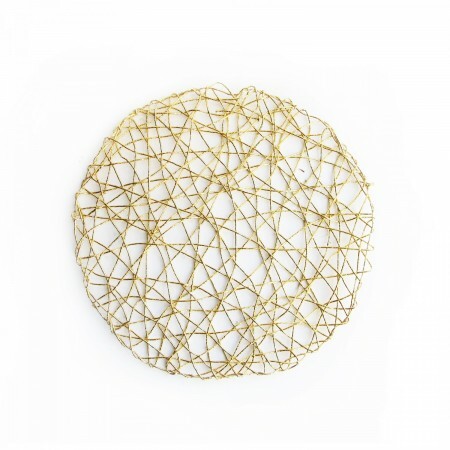 With a gold color and crafted from metal, this ornamental placemat can be used to serve meals in style while protecting the table from spills and messes. Measuring at 14-1/2" in diameter, it has plenty of room to hold salad bowls. dinner plates and dessert plates, while at the same time adding glitz and glamour to your tabletop decor. Durable and hand washable, it can be used time and again in any dining establishment.